Second Skin Theatre’s Artistic Director Andy McQuade’s has pulled together a group of writers and actors who use some of Poe’s most celebrated works as the jumping off point for their own febrile re-imagining of his gruesome tales for these gruesome times. Hence the victim of the Pit and the Pendulum is an Afghan under interrogation; Premature Burial concerns a soldier in the same conflict; the Masque of the Red Death is a quasi-Nazi rallying call; and The Black Cat is a deranged mother’s tale of jealousy and depression. There are some very fine performances from the ensemble: Stephen Connery Brown is devilishly charming as the fallen preacher and David Hugh recalls Klaus Kinski’s Nosferatu as The Raven; Michael Amariah is funny and fearful as the soldier doing his country’s bidding; and Mia Zara is frighteningly convincing as the cat-fearing mother. Undoubted star of the evening is the old church itself, the potential of which is fully exploited in the production’s promenade format. 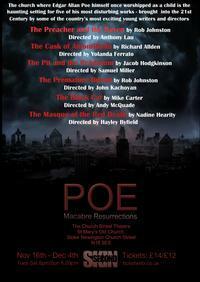 Lighting team Sarah Grogan and Anna Sbokou find eerie shadows that complement Poe’s metaphorical darkness unsettlingly; the audience’s tight corralling around the font mirrors the incarceration of Priyank Morjaria’s interrogated prisoner; and the using of the ancient cemetery that surrounds the church for Premature Burial is obvious, but spectacularly realised. See it – and be scared, surprised and shocked! Post-Hallowe’en, pre-winter solstice, just a hint of the foggy London nights of yore, what better notion for Second Skin than to re-visit the work of that baleful son of Stokie, E.A Poe? I say “re-visit” advisedly : apart from the resonating but much-truncated Raven of the first of six pieces of the evening, be ready for startling re-imaginings of the old melancholic’s works. Be ready too for startling new writing : a bold decision, given Poe’s wondrous way with language. This church is a treasure-house of usable things for a show like this. If you have an altar, a gallery, a grill to the crypt, box pews, plain stuccoed walls above Tudor arches, sepulchres within, a graveyard without, powerful acoustics and dark shadows everywhere, use them. Second Skin does, comprehensively, with bold lighting and high-impact sound … and in one piece, most spectacularly : no need for spoilers. That said, that there is some electrifying new writing, in The Pit and the Pendulum and Premature Burial in particular. We have full-on updating from the Toledo of the Inquisition to the cells of Abu Ghraib, and from Poe’s first-person narrative of “charnel apprehensions” to the dangers of Helmand. Poe’s prose has gone, but there are new resonances ; new rage as well. But The Black Cat hits the perfect note. The family situation, the gender of the narrator, the dark deeds are all adapted, but the best of Poe’s writing is preserved and above all the quality of the lucid yet raving narrative. In Mia Zara’s mesmerising vocal and physical performance under Andy McQuade’s sensitive direction we get the full, claustrophobic Poe experience. It would be invidious to commend the acting without mentioning Priyank Morjaria’s tour de force in The Pit and the Pendulum, peopling his chamber of horrors both with his tormentors and his remembered family : a touching, shocking and riveting performance, the obscenities uttered in his pain and panic echoing legitimately around the ancient, hallowed walls. Site-specific, promenade productions are one of the great strengths of the Fringe. It’s truly appalling that a wonderful, unique and historic venue like St Mary’s should be under threat, as are so many others. If it’s your local, please support it. I don’t normally justify stars, but on this six-part production I should just say that it is, indeed, a **** production, plenty of very sound three-star stuff going on, but at least two performances that are shakingly excellent. What an evening! Rumours scurried around the pubs in Stoke Newington when Second Skin Theatre’s tenure at Ryan’s Bar on Church Street came to an abrupt end. Quite frankly, the hearsay – whether its tantalising La Chunga was too provocative for the landlord – is not the concern. I’m more interested in the company’s response. And, nodding to Punchdrunk’s stifling Mask of the Red Death at the BAC, its decision to infect every nook of the Rectory of the Old St Mary’s Church with Poe’s insidious, macabre imagination was unnerving, yes, but also inspired. Relocating to such a monumental building in the heart of the area was also welcome proof of its commitment to the community in north London. Fitting then that it is a strong, communal effort, from artistic director Andy McQuade down through his ensemble of keen-eyed directors, the energetic cast and writers who know how to graft a modern mask onto the short story master. The whole site, from the altar to the font to the graveyard, is alive, bolstered by the superb sound design that breathes in the background. As our guide, the Preacher, Stephen Connery Brown is masterfully unbalanced. His intuitive pronunciation echoes into the darkness of the church and Poe’s imagination, and, if at any time the pace of five different stories starts to lag, his complete performance tugs you back into the atmosphere and reminds you where you are – a gloomy, cold burial ground. As a fringe production, and with tight purse strings, this does not ascend the heights of Punchdrunk’s magnificent reimagination. That said, it is still a marker of an adroit ensemble that promises more gripping, and hopefully grisly, treats for the future.